Evil sometimes triumphs temporarily, but never conquers. Who is the impractical joker with a key to crime? With a maniacal laugh, a twisted sense of humor, and penchant for setting cunning traps, the Joker is one of Batman's most notoriously fiendish foes. But when it comes to putting an end to the Joker's crime sprees, Batman knows firsthand that the Joker's jokes are never very funny... in the end. That line about "a key to crime" doesn't seem to make any sense. It's not a pun, it's not a joke, it's not a stock phrase... it seems like a random string of words. But the Season 2 episode "The Impractical Joker," opens with Joker pulling a whole series of key-related crimes: tearing up a copy of The Keys of the Kingdom in the Keyborne Bookstore; smashing a record called Take the Keys to My Heart in the Key Note Music Shop; setting fire to the Gotham City Key Club membership files; and playing havok with the big sign on the Keystone Building. It doesn't make any more sense in context, but at least it lends some logic to the otherwise-weird text on the packaging. The episode does give us a rare bit of backstory on the Joker, though: Batman says that when he was younger, Joker was a well-known hypnotist. How very specific. Joker was played by Cesar Romero, an actor best known for A) playing the "latin lover" type, and 2) his mustache. He was so known for his mustache, in fact, that he refused to shave it off for the role - the makeup department just painted over it. The toy pays homage to that through the use of a small patch of gray paint on his upper lip. The likeness is good, though it's lacking the exaggeration needed to make it look hyper real. And in fact, that sums up the figure pretty well: though the toy is a technically accurate match of what he wore on the show, there's no art to it (for lack of a better term); it's not that the sculpt is unskilled, just that they didn't "push" things at all. Making music isn't just a question of hitting the right notes at the right time (sorry, Guitar Hero), and a good sculpt is more than just making sure the wrinkles look identical to your reference photos. It lacks soul. Joker's TV costume was very true to the comics. His suit is pink, instead of purple, because purple is a very hard color for the television broadcasting process to accurately reproduce, but he's still got a vest and a green shirt on underneath it, and a floppy black bowtie dangling around his neck. His pants have black pinstripes, in classic Joker style, and all the buttons on his coat are painted well. 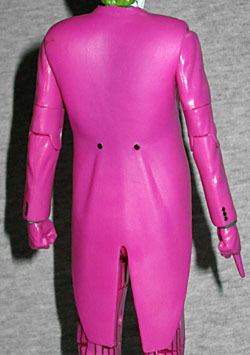 The jacket is a PVC shell, and it ends up looking too large on the figure. His torso should have been made slightly smaller to account for the extra bulk (it doesn't help that his head is about 20% smaller than it should be). 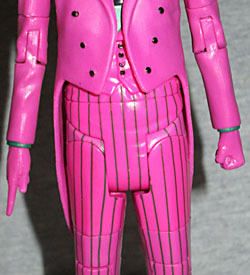 Also, due to poor color-matching, the hips and upper legs of his pants are a darker pink than the rest of his clothes. When he saw concept art of his Joker costume, Cesar Romero thought it looked absurd, and broke out in an exaggerated laugh. One of the producers overheard, and told him that was the maniacal laugh he should use for the character. The figure has all the same articulation Mattel always gives its toys. If they're not going to bother doing anything good, we're not going to bother listing the joints. Joker's left hand is a fist, and his right hand is pointing, so that's pretty neat. Very theatrical. Joker has no accessories, because unlike Penguin, he has no trademark items (at least, not on the show - the comic version has lots of things you can probably think of). He does come with the line's usual half-circle display base, though. Measuring 4¼" wide and 2⅜" deep, the base has a sticker on top reading "ZAP!!!" (which just so happens to be the first sound effect to pop up during "The Impractical Joker," bringing us back to that episode again - even the same colors!). The back shows more of the Batcave, including a bit of the Batmobile and the red Bat-phone. 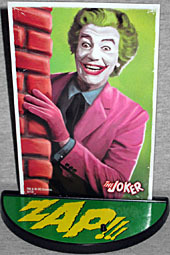 No disresepct to Heath Ledger or Mark Hamill, but Cesar Romero really is "my" Joker. TV Joker isn't as menacing as the Joker in the comics, but he's still dangerous, and he has a better sense of humor - he's playful, not hollowly psychotic (and certainly not whatever effeminate mess Grant Morrison tried to turn him into). I'm happy to have this figure, but with its various flaws, it really doesn't do the character (or the show) justice.